I should mention I have a real problem with this label being red. I'm not sure why but I do. Yuengling Brewery's information can be found on our Black and Tan page or the Lager page. This beer is pretty good. The problem is that it's late May in New England so it's already hotter than her. The porter itself has strong tastes of coffee and cocoa. It's a medium heaviness of beer. I've had some heavier porters such as this, and lighter porters such as this. Yuengling charges a little more for the porter than their regular brews but it's a pretty good beer; for the winter. Drinking this is a summer is as smart as taking your sister to the prom. You can make your own Black & Tan by adding 60% Porter and 40% Yuengling Premium and 2% Butterscotch Ripple. In short, this beer is pretty good. I like the Black and Tan better but this is a nice sipping beer that any midnight campfire can oblige. 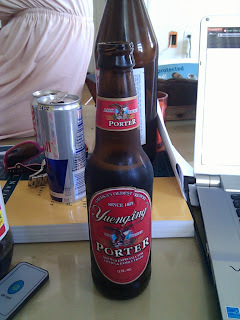 If you are in Pennsylvania, no other porter will do.